The N.C. Chronicles. : Should we replace chauvinism with feminism? Can women do better than we did? Should we replace chauvinism with feminism? Can women do better than we did? Men are not from mars and women are not from venus, if we were I would say ok, it is possible since we are not the same race...we think differently. We are different sides of the same coin, so, why should we believe one would do better than the other? Would we not do better if we worked together as the same race with the same goals? I would point out that historically women in power have done the same thing in wars, crimes, greed, lust, just like anyone else. Some have also been good leaders, just like their gender counterpart. It does not matter who runs things, the end game will be the same, so why let old hags (feminists) tell us women are different than men???? When we listen to them, give them power, or simply let them spew out their twisted idealism without the balance of at least debating what they say, they will take advantage of it, just like anybody else. The only way we can achieve a better life is not by arguing who is better, but by recognizing we are the same, only opposite genders. Divisions, is how the weak hold on to power, feminism depends on a portion of society to listen to their hate messages, as long as some fight for dominance over the other, they continue their existence. If we were to understand our need for each other, think of the possibilities. Everyone who was born with an individual gift, could express it, offer it, and make things better by been free to be who they want to be. Instead of repressing each other by listening to the weak minded who thrive on seeing us arguing who is better, we could walk away from those who have an inferiority complex and offer the world a better view of things. For now, we are the dominant race, on the ball floating in space, we are wasting the time we have, to listen to those with a chip on their shoulders? Picking one gender over the other, simply continues the pattern of destruction. As always, kids suffer. Are we so small, that we will accept the idea that it is now time for women to be in power, give everything to girls, after all boys had their day, it's now their turn, wasting more time before we realize, not working together as left us in the same situation??? Isn't this what they are accusing men of doing to women? So, if I get them right, we should do the same to boys, this will make things...better? Here is a radical idea, why don't we make sure none of our kids fall behind? 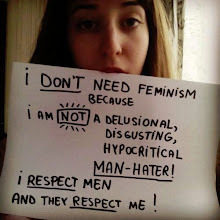 This is why it is so stupid and destructive to listen to a feminist. Thats a good point, comparing feminism to chauvinism.Its the same thing if we thing about it.